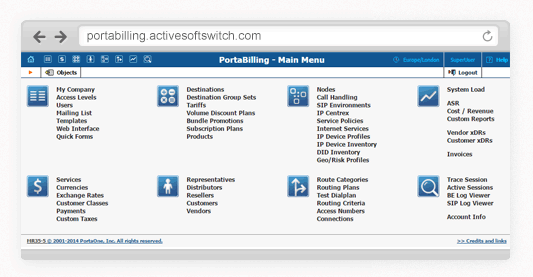 Active SoftSwitch can provide your Customers with a full range of Hosted Telco Services. It takes a world class service engine, adds more than 50 Apps and Modules and presents it all in your Brand. Here's What, Why and How! Five great reasons to choose Active Softswitch as your Telco service platform. Setup your solution in 4 simple steps. Step One - Set up the Basics. ICC provides full Root Access to the Porta Switch Partition at the core of your Active SoftSwitch Service. Then we provide up to 10 hours of training so that you can easily configure your Users, Termination and Origination Vendors, Tariffs, Products and much more. Or if you prefer, we will do that part for you. Step Two - Build the Functionality you need. Setup your Fully Branded Custom Registration Forms. 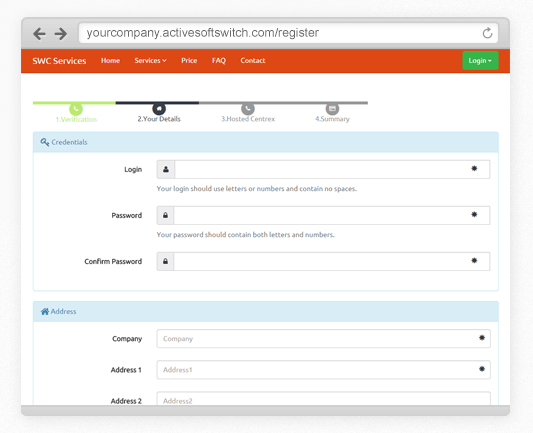 Using Active SoftSwitch Content Management, you can create the fully branded Registration Forms that you will use to register your customers accounts onto your service. It's just a form, but you can add your business personality to it and it's as simple as drag and drop. Step Three - Add the User Interface Structure. Now you decide which widgets and modules (My Balance widget, Extension Summary module, etc.) you want to show in your site and where you want them to be on the page. Creating a unique telecom offering is very simple and does not require development skills. Add your own Brand, Content and Imagination. You should take a short cut here and choose from our ever growing stock of “Recipes” (see example below). A Recipe does all the tricky bits out of the box, but then you change the theme to match your brand, add in your logo, graphics and content and all the things that make your business unique. When you are happy, point your domain to your new Active SoftSwitch site and you are ready to launch your service! What is a Content Management Service Wrap exactly? It means that all the tools, services, apps and modules that you need to run your service, are all in the same place for both you and your customers to access. For example you get a fully branded website with all your content, your on-line registration forms, your payment systems and so on, all managed in your new Content Management environment. Why do you describe it as Integrated Content Management? Because the two parts of the service, PortaOne and the Content Management, are highly integrated. So, when you make changes to an app or module in Active SoftSwitch, it will populate the data into Porta, where necessary. Who do the customers belong to? You. With Active SoftSwitch, you are not a reseller. The solution is yours and therefore, the customers are yours. Will my customers know I am buying the service from Active SoftSwitch? No; Active SoftSwitch is fully white branded. Will I have unique IPs? Yes; Enterprise partners will receive a unique SIP IP as well as a unique IP for their website. Ultimate partners will also receive a unique Admin interface IP for their resellers. Are there any additional hosting costs with the website? No; Hosting, IP and SSL are included in your monthly fees. Do you charge per Account/Extension/Customer? No; We charge for the traffic on the platform when you go above the included limits. Any revenue generated from Account rental is 100% yours. Can I resell Active SoftSwitch to other telecom operators? Yes; Ultimate Partners can resell the Lite package in their brand to their clients. Does "included Minutes" cover termination? No; Termination is an additional cost. You can choose to purchase termination from ICC or other telecom partners such as BT, Tata, etc. Is PortaOne a Class 4 or Class 5 Softswitch? Both; While Porta will handle your higher level network services, so routing, pricing, reporting and much more, it also has the full list of class 5 office user features for Centrex or hosted PBX. If I launch my business providing Centrex Solutions, at a later stage can I provide additional solutions such as Calling Cards? Yes; You can either launch separate sites for your individual solutions or you can combine some of the solutions to create a very unique offering. 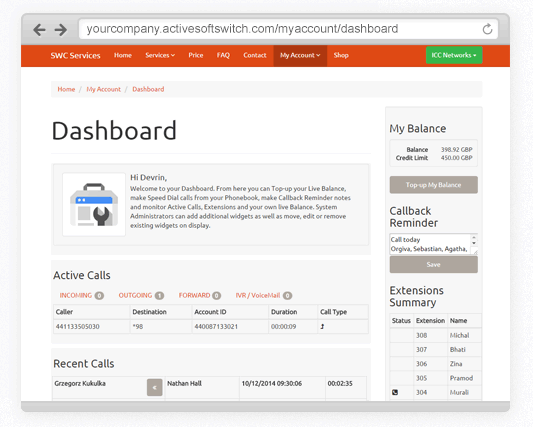 Active SoftSwitch is our service platform. It has PortaOne at the core for all the traditional telco services and our Content Management service wrap so that you and your customers can easily interface with it. What does Fully Brandable mean exactly? 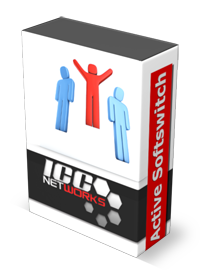 It means that when you rent this Software as a Service, and use it to serve your own customers, all they see is your brand, not ICC or Active SoftSwitch. Every Bill, every Email, every page of the site, its all 100% yours. With your Centrex service, how many access levels are there for the Customer interfaces? There are two access levels - Admin and Extension. You can define in the permission levels of your widgets and pages which access levels can see what content. e.g. : You can hide all billing information from Extension users and show it to Admin users only. Can I edit the style sheets of the site to further customise the look and feel? While you can modify the look and feel by simply choosing themes and colour combinations, you can also edit stylesheets and insert scripts to customise the site further. Yes; We have a minimum commitment guarantee. you only buy one month of service at a time. We believe you will be a long term partner because Active SoftSwitch will be a successful and profitable solution for you, not because of a long term contract. Can I port DIDs (Numbers) to your platform? Yes; your client's numbers can be ported to us or any other DID provider you choose to partner up with. Active SoftSwitch solution runs on 14 servers. These servers individually have their own tasks to run the solution as smoothly as possible. However, they also smart enough to take on additional responsibility if something goes wrong with one of the servers. We understand your data is most important. The databases are replicated on all our servers in multiple locations, except customer credit card data. Do you have additional security solutions to prevent losses from fraud? Our STEM-Pro service can monitor the traffic on your platform and alert or block when it recognises suspicious activity. Can you carry out technical tasks for us? Yes. You can subscribe to Intelligent hands where our technical team can carry out technical tasks for you such as uploading tariffs, creating products, testing new termination partners etc.